Rising 10,000 feet above the sunburned faces of 2.2 million tourists a year, the largest solar telescope on the planet is under construction atop Haleakala Crater in Maui, Hawaii. Never mind all those admonitions about never staring at the sun. Astronomers can’t wait for the chance. Named for the late Senator Daniel Inouye, the Daniel K. Inouye Solar Telescope or DKIST will be the world’s premier ground-based solar observatory in the world. With its 4-meter (157.5-inch) primary mirror, DKIST is capable of distinguishing features down to 0.03 arc seconds or just 20-70 km (12-44 miles) wide at the sun’s surface. To achieve such fantastic resolutions the telescope will employ the latest adaptive optics technology to cancel the blurring effects of the atmosphere using a computer-controlled deformable mirror. Consider that the smallest features visible in large amateur telescopes are solar granules, columns of hot gas rising up from the sun’s interior. Each spans about 930 miles (1,500 km) and together give the sun’s surface the texture of finely-etched glass. DKIST will resolve features more than 60 times smaller. 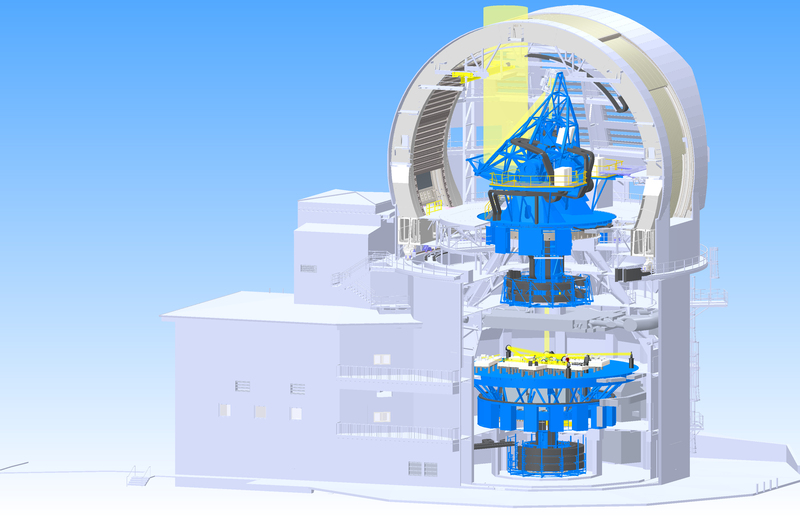 The current largest sun-dedicated telescope is the McMath-Pierce Solar Telescope , which has kept a steady eye on the home star with its 63-inch (1.6-meter) mirror since 1962 from Kitt Peak, Arizona. DKIST will focus on three key areas: What is the nature of solar magnetism; how does that magnetism control our star; and how can we model and predict its changing outputs that affect the Earth? Astronomers hope to clearly resolve solar flux tubes – magnetic field concentrations near the sun’s surface – thought to be the building blocks of magnetic structures in the atmosphere. We still lack a complete understanding of how energy in the sun’s turbulent, churning interior is transferred to magnetic fields. Earth’s magnetic field is about 0.5 gauss at the surface. Fields within sunspots can range from 1,500 to 3,000 gauss – about the strength of a bar magnet but across a region several times larger than Earth. A better understanding of small scale magnetic structures, too tiny to be resolved with current telescopes, will help make sense of broader phenomena like sunspot formation, the heating of the solar corona and why the sun’s energy output varies. The solar constant, the amount of radiation we receive from the sun, increases with an increase in solar activity like spots and flares. Since the smallest magnetic elements are the biggest contributors to this increase, DKIST will be the first telescope able to image and study these structures directly, helping astronomers understand how variations in the sun’s output can lead to climate changes. DKIST will do its work on rapid times scales, taking images once every 3 seconds. For comparison, NASA’s orbiting Solar Dynamics Observatory takes pictures in 8 different wavelengths every 10 seconds, STEREO one image every 3 minutes and SOHO (Solar Heliospheric Observatory) once every 12 minutes. The speedy shooting ability will help DKIST resolve rapidly evolving structures on the sun’s surface and lower atmosphere in a multitude of wavelengths of light from near-ultraviolet to deep infrared thanks to the the extraordinarily clean and dry air afforded by its high altitude digs. The new solar telescope will be in excellent company not far from the current Mees Solar Observatory and a stone’s throw from the Panoramic Survey Telescope and Rapid Response System (Pan-STARRS) telescope, the 79-inch (2-meter) Faulkes Telescope North and Maui Space Surveillance Complex which keeps an eye on man-made orbital debris. Tourists to Mt. Haleakala, a popular destination for tourists, can watch it take shape in the next few years while enjoying a hike in the cool air for which Haleakala is famous. I first heard about the DKIST telescope from a burly stranger with fierce-looking tattoos. My wife and I vacationed in Maui last fall. One afternoon, while watching surfers ride the waves near the beach town of Paia, this big guy overheard us mention Duluth (Minn.), our hometown. He said he’d lived in Duluth for a time before moving to Hawaii and offered us a beer. We got to talking and learned he worked safety inspection at at the “biggest solar telescope in the world”, making the hour-long drive up the mountain 5 days a week. I checked it out and he was absolutely right. The Daniel K. Inouye Solar Telescope (formerly the Advanced Technology Solar Telescope) is being developed by a consortium led by the National Solar Observatory and comprising the University of Chicago, the New Jersey Institute of Technology, University of Hawaii, the High Altitude Observatory, NASA, the U.S. Air Force and others. For more details on the project, click HERE. There’s poetry in building a large solar observatory on an island known for its sunny, warm climate. While vacationers flop out on Kaanapali Beach to vanquish the mid-winter chills, astronomers 50 miles away and 10,000 feet up will be at work coaxing secrets from the fiery ball of light that illuminates surf and scope alike. The resolution of DKIST is just a factor of 3 better than the GREGOR solar telescope. The time resolution is even 30 times slower (3 seconds compared to 1/10th). I dont know about the other scientifically more relevant features, like spectral resolution, etc.. but the GREGOR instrument seems to be not so far behind in terms of scientific capabilities. Might be nice to compare GREGOR with DKIST, especially because GREGOR is already operational. that CME looks downright scary! I can’t wait to see the sequenced event shots! !